This table shows the match-ups and scenarios for each round. Congratulations to Travis for what sounds like a very close win. OK guys, catching up some after vacation topics. We are both having trouble bringing up the logfile, it looks like neither was saved properly; unsure of why it didn't work for either of us. A shame because they were both very exciting/stressful games that could've gone either way. Congratulations to Trevis for the victory and to Michal for a well fought final. Post the log files please if you have them. Logfiles and more specifics will be added later, but I wanted to take a moment and salute MichalK for a great performance in the MT61 finals. The Battle of Silarus was surprisingly won twice by the left command of the Servile army of Spartacus. In the first game, a 6-3 result for the Servile forces, I was able to withstand Michal's Roman ranged assault just long enough for a small opening to form. In a risky maneuver, I was able to hit him with charging warriors (DT) and charging light cavalry (MC) in successive turns, with my rolls and mobility of the latter proving to be just enough to get the banners I needed. Michal was certainly unfortunate with a few rolls to be sure, and the score left me with a seemingly comfortable cushion for the second game. 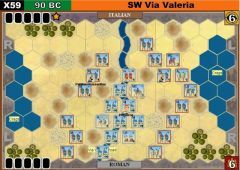 Even though the 2nd game was a 6-5 win for Michal, he very nearly pulled off the stunning overall victory, and was within a single die roll of overrunning the Roman right (and center) on a couple of occasions. 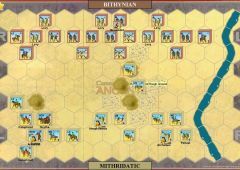 I had settled in for a siege of the Servile position, due to the fact I had few cards that supported a move by the center. 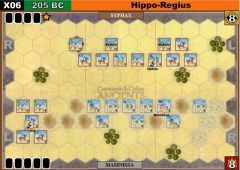 Michal picked the perfect time to engage the Roman right, after I had expended too many cards getting troops into position and moving a leader up for support. 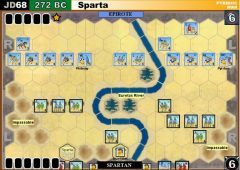 His combined forces of cavalry and infantry placed two full strength warriors on the verge of collapsing the entire side, and capturing the necessary banner by taking the camp hex, but I was able to just barely withstand the Spartacus-card charge, and then finally collected cards that allowed me to properly respond to the crisis. Michal deservedly won the battle, but I was able to do enough last-ditch damage to win the combined score. Again, I couldn't save my log file and I know Travis' was interrupted because he needed to resynch to me.....so I'm going on memory. There's some glitch in my Vassal module.....I'll have to update to Giulio's brand new you beaut one . I moved to challenge the slave Light Cavalry in the woods on the Roman left and managed to brilliantly get my Light Cavalry cut off and killed (this is before the coffee kicked in, or that's my excuse).......then lost my leader there on a double helmet (not the first time this tournament.....I'm obviously sacrificing the wrong colour goat). I pulled back my left and consoIidated on the baseline. I thought that was it and was just hoping for a few banners to make it look less shameful. The Slave centre advanced and I had to desperately Double Time my other flank there to support. Two Line Commands made my positioning there easier. In short there was some desperately bloody work round the ramparts and the rampart defensive benefits proved decisive. It ended with a lot of 1 block units (who would have ben zero block units if not for the ramparts) and I managed to finish off a couple of 1 block Slave units to finish it......could have gone the other way. No Slaves escaped. A great match, thanks Travis, and well played. Just to mention that Michal's attached log file is for the new (and fantastic) version 4.0 of the VASSAL module. MK20336 (Roman) 4 banners, 17 blocks lost. up Roman leader attacking over wall kills two more. Down 4-3, Slave kills a 1 pt unit and Hail Marys a damaged W to pin a 4 pt Roman LI, but rolls 3 banners for the win. 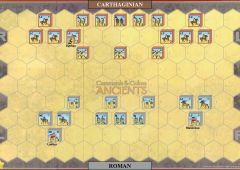 Romans had a good card every turn, Slaves started with Move Hvy, Move Lt, Mv-Fire-Mv, and mv 2 on right throughout game. Michal played well in unbalanced scenario. Although historically the Slaves should be easily dispatched, the game does not reflect it so clearly. After some range attacks, Travis Warriors charged into the center of my line, successfully splitting this into two. Move-fire-move allowed me to regroup and start moving forward on my right when disaster struck on my left - a double helmet was rolled on leader-check. Thanks to Travis for organizing the game on the short notice. 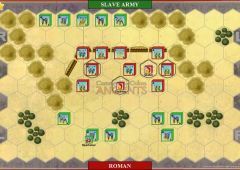 Confusion reigned as two veteran players made several retreat-related mistakes once the Slaves broke through the Roman fortifications. 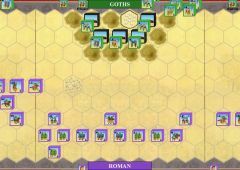 With Roman units pushing hard outside the ramparts, it took many strokes of luck and some critical hits to finally secure a camp hex and eliminate the final unit needed for victory. 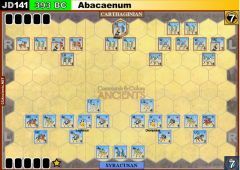 Tough battle for the Romans, Slaves had a great start and kept up the pressure. 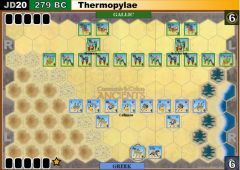 This battle was fought almost entirely on the left flank, or the left side of the center. 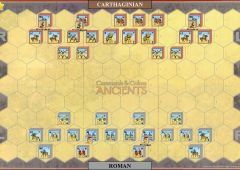 Slaves seemed to have the luck and cards here and the Romans couldn't get the break they needed. As you can see from the score above the game was tight. The battles in the ditch with the rampart caused both sides to beat each other down slowly with 2d attacks and battle backs. As the Slaves pressed through the ditch and over the ramparts they took losses but finally gave the final blow just in time to claim victory. The game lasted just two rounds and a half. Slaves started with an Order Medium and were lucky enough to kill both Roman leaders. I was making a bad mistake here but fortunately, Michal and Marcin stopped me: after killing a leader, a unit CANNOT advance. 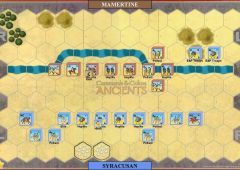 With a fire-and-move, the Romans, now leaderless, reposition to occupy their camps and reduce one Slave aux to two blocks. Slaves then played "I'm Spartacus". The result was disappointing, just three units ordered out of 8 dice, but the attack rolls were good and the Slaves conquered one camp. 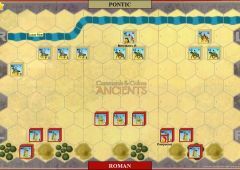 The Romans replied with a Line Command but failed to eliminate any Slave unit. A leadership any section gave the Slaves the last victory banner. Being so fast, this game very much depends on the initial hand of cards and the opening rolls. Honestly, there was little Marcin could have done to improve the final result for the Romans.